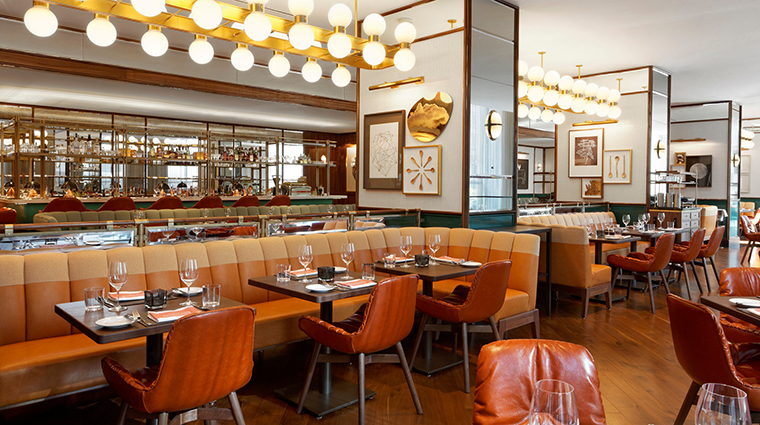 Café Boulud Toronto at Four Seasons Hotel Toronto has reopened with a splash, bringing a new look and warm, lively environment reminiscent of the fabled brasseries of Paris. 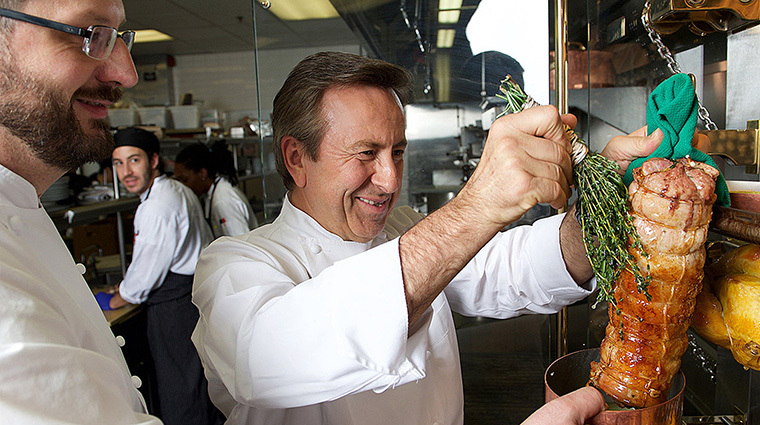 The chef/owner, of course, is Lyons native Daniel Boulud, and he’s constructed a menu of French bistro favorites and contemporary plates for the Toronto outpost. 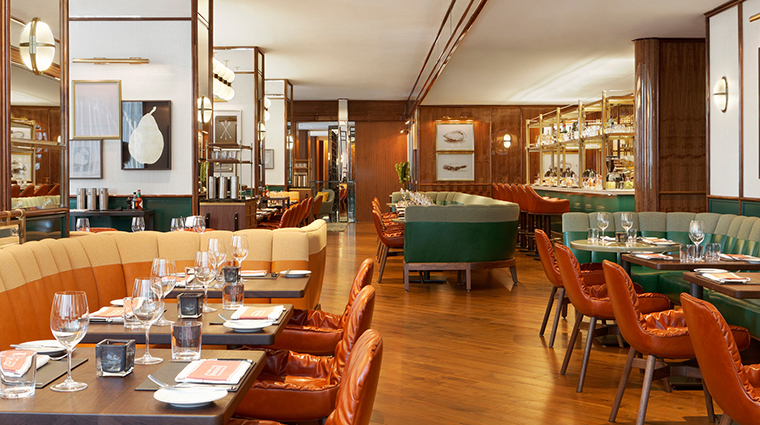 Located in the iconic Yorkville neighborhood, surrounded by the city’s designer shops, the new Café Boulud is ideally situated for a meal before or after exploring the buzzy area. 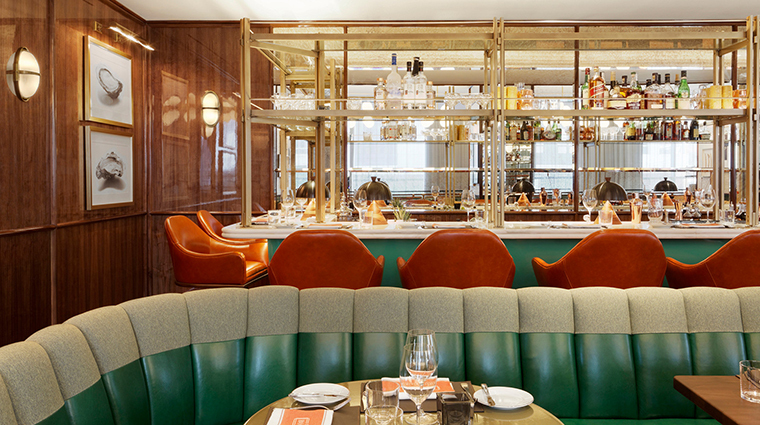 A Toronto hot spot since its opening, Café Boulud was recently redesigned by London’s Martin Brudnizki Design Studio (whose work includes The Ivy and Cecconi’s Miami Beach) — the result is a charming ambiance within a retro-contemporary French brasserie. 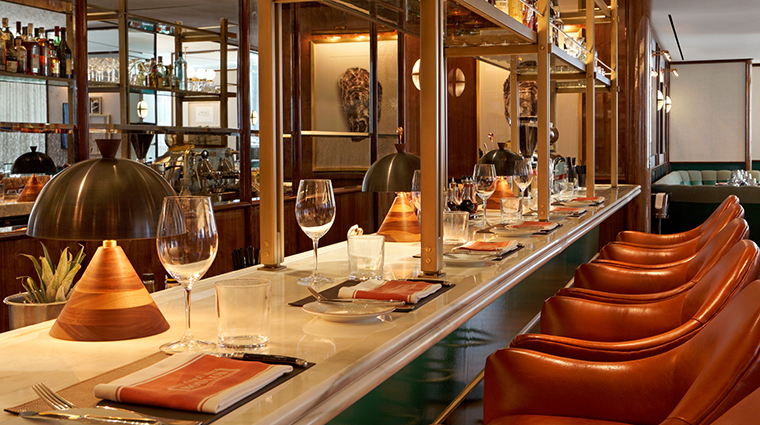 Belly up to the counter bar for a quick bite or a drink or two — from handcrafted contemporary cocktails to traditional favorites, the drink program at Café Boulud is sophisticated and varied. An extensive collection of vintages curated by wine director Drew Walker features traditional French appellations while also highlighting local Ontario producers. Throughout the Toronto restaurant come dinnertime, a low candle on each table throws a soft glow on the surrounding modern rolling chairs and luxe gray velvet banquettes. 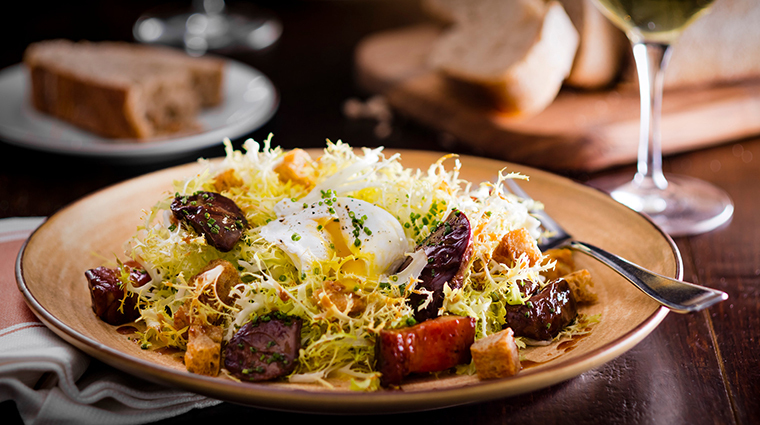 Breakfast is served at Café Boulud Monday through Saturday, though during the last half-hour on weekdays, only continental offerings are available. On Sunday, breakfast service is followed by brunch from until 3 p.m. The Toronto restaurant is open for dinner seven days a week. Though Café Boulud Toronto is one of chef Daniel Boulud’s less formal outposts and the dress code is officially described as “casual chic,” there’s no doubt that Torontonians and guests of Four Seasons Hotel Toronto (in which the restaurant is located) arrive for their reservations looking dapper. Reservations are recommended for Café Boulud Toronto, and are easy to make via the restaurant’s website or the website of Four Seasons Hotel Toronto (in which the French restaurant resides) — both sites use OpenTable for booking. 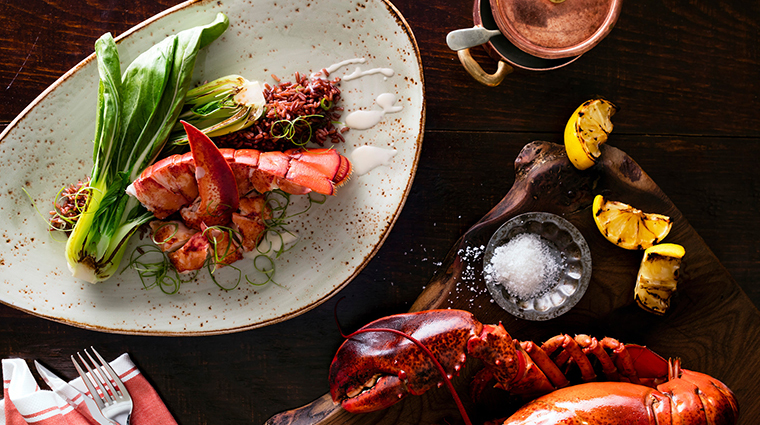 Chef-owner Boulud and executive chef Sylvain Assié have created a menu that highlights favorites from the French countryside, like steak frites, boudin blanc or Lyon-influenced Quenelle de Brochet, northern pike dumplings in a Nova Scotia lobster sauce. 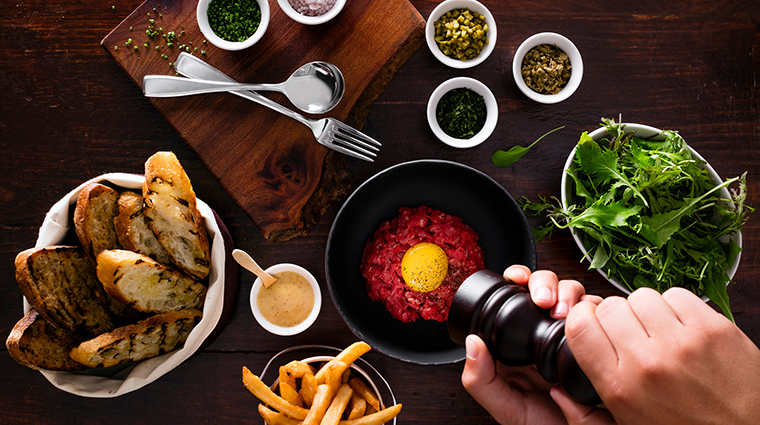 But the seasonally inspired fare on offer also includes international twists such as bouillon pho, an appetizer of spiced beef broth, rice noodles and ginger, and Moroccan-style yellowfin tuna tartare. 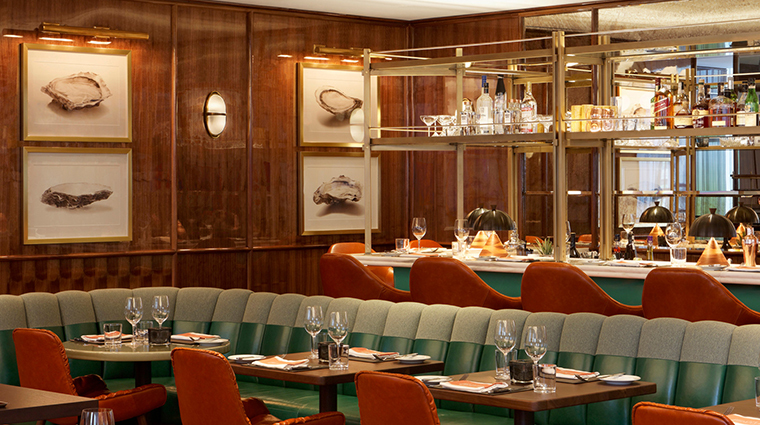 Another highlight on the menu features the kitchen’s impressive rotisserie with poulet à la broche, rotisserie chicken that’s been cooked to perfection then served tableside in copper tableware. 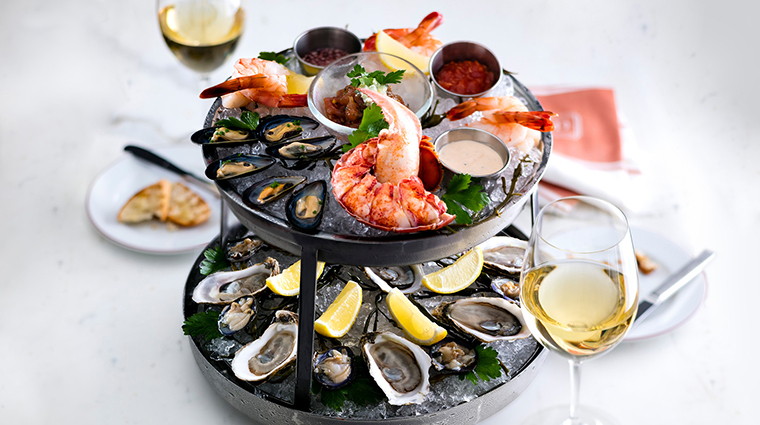 The menu also celebrates Canadian ingredients like a seafood platter featuring Canadian oysters or the country-style pâté featuring Canadian goose, duck, foie gras and cranberries. 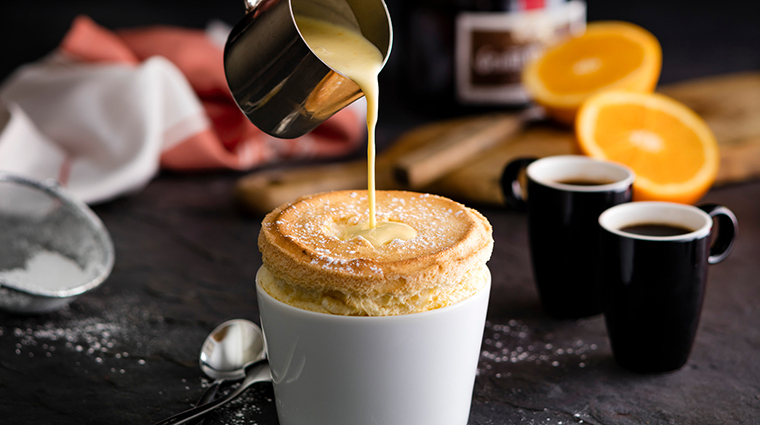 Desserts are decadent, too — go for the soufflé Grand Mariner with crème anglaise and a warm basket of madeleines. 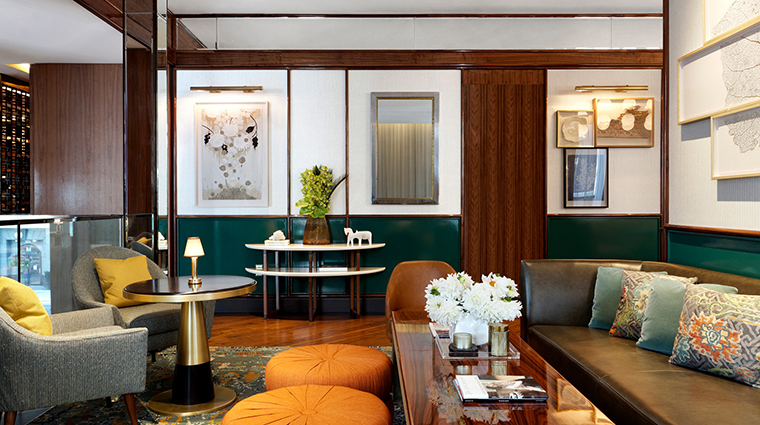 Sophisticated and yet inviting, the space features ribbed wrap-around banquettes upholstered with slick Jaguar green and tan leather, blue herringbone Hermès wallpaper, walnut accents, brass accessories and mirrors upon mirrors upon mirrors. Floor-to-ceiling windows on two sides of the restaurant allow a peek at tony Yorkville below, as the sounds of lively first-floor lounge Dbar waft up the floating staircase that connects the bar and restaurant. 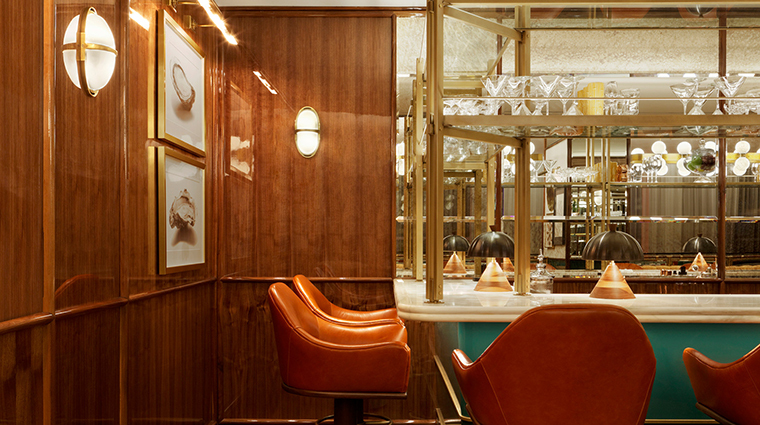 The retro dining counter is the heart of the restaurant, made with glassy lacquered wooden panels, Calacatta marble and framed with a bronze and glass gantry that makes you feel as if you were transported to a different decade.